This children's book provides an introduction to airplanes, discussing how they fly, the main components to an airplane, and the history of the airplane. 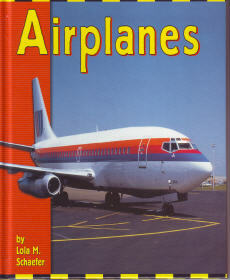 Airplanes book: Grades 2-3, Interest Level: Grades 2-4, Ages 4-8, 24 pgs, hardbound w/Library Binding. TOP QUALITY.